Be with Hello Kitty, Anytime, Anywhere! Good news for Hello Kitty and “Tamagotchi” fanatics out there! Ever wanted to have Hello Kitty as a pet? Now you can! 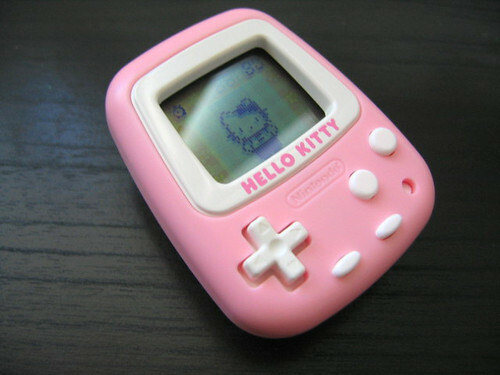 Introducing the Pocket Hello Kitty!It is officially licensed by Sanrio, made by Nintendo and has been out since 1998. This “Tamagochi“-like gadget will surely be a great addition to your collection. It features unique gameplay. Its basis is how many steps you take in real life which becomes ‘kitts’ on the game. A good way to earn them is by walking or jogging a lot which can be good exercise as well. It’s so small too, it easily fits inside your pocket! In this game you explore “Kitty’s Forest” where you can find lots of items to customize Hello Kitty with and meet new friends.